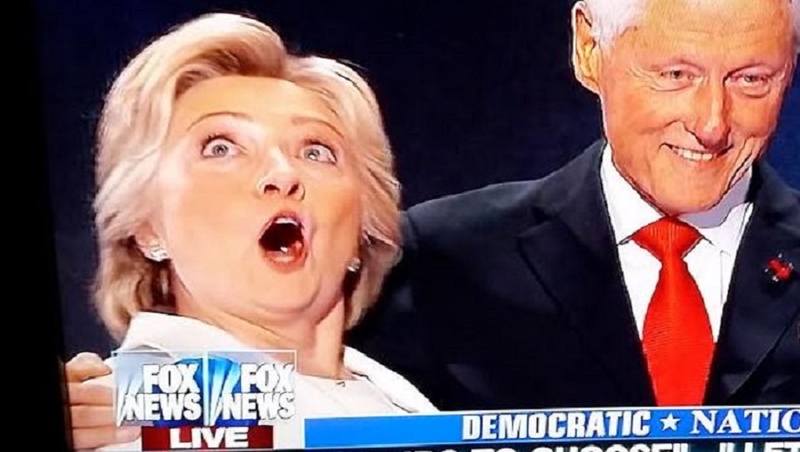 Photograph: At the end of the Democratic National Convention, Hillary Clinton either displayed a bad case of overacting or she was having a ‘short circuit” incident that she used as an excuse during a TV interview. “Leave it to a malignant narcissist like Hillary Clinton to command all the attention of the news media on a day considered ‘holy’ by many Americans — the anniversary of the 9/11 terrorist attacks on U.S. targets,” said former NYC cop Dawson Conyers. “Suddenly it’s not about the men and women who died on that horrible day and it’s not about their loved ones — tears in their eyes — remembering the victims of Islamic radicalism. Nope. It was about Hillary Clinton the alleged criminal running for president feeling a bit sickly,” he said. According to reports that began to trickle out, Mrs. Clinton appeared to stagger and faint in footage showing her early exit from a 9/11 commemoration ceremony on Sunday. A video of the incident shows how her entourage including the Secret Service agents attempted to conceal her near collapse and rush to get her in her waiting security van. 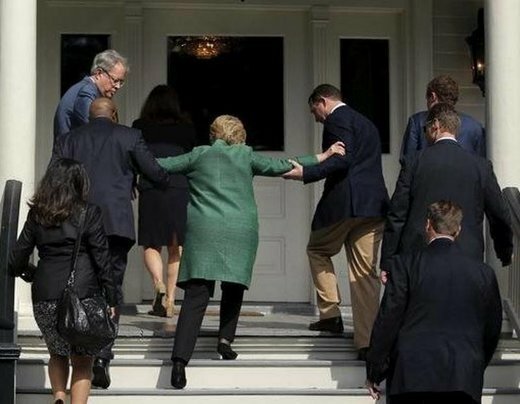 After a previous incident, the campaign claimed that Clinton merely tripped on the stairs. And the news media accepted that as the truth. Although Clinton’s doctors at first said the episode was a result of heat and dehydration, they later claimed it was the onset of pneumonia. The Democratic presidential nominee fell on her way into her van and had to be helped by her security, according to witnesses and video of her leaving. She was “clearly having some type of medical episode,” a law enforcement source told Fox News, according to Tweets by Fox News reporter Rick Levanthal. After more than an hour of silence, Clinton’s campaign finally issued a statement saying the former Secretary of State “felt overheated,” and later Sunday afternoon they issued another release blaming the episode on pneumonia and dehydration. Video taken at the scene of the 9/11 ceremony at ground zero and posted on social media shows Hillary Clinton appearing to faint before getting into her van.